(CNN) -- Severe weather this weekend spawned tornadoes that devastated the country's heartland. 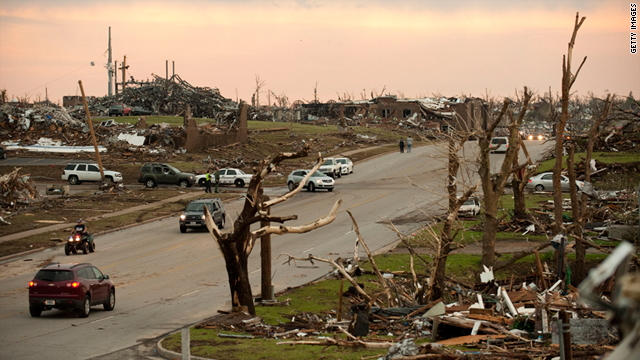 The greatest destruction was in the city of Joplin, Missouri, where at least 125 people were killed and a quarter of the city's homes and businesses were reportedly damaged. As organizations and first responders provide emergency relief, food and shelter, many people across the country are looking for ways they can help. AmeriCares has sent disaster-relief personnel to Joplin, and it's working with Access Family Care Clinic to help victims. This expands AmeriCares' tornado relief operation, which has been assisting various Southern states as they recover from their own recent tornado outbreak. Those wanting to help can text the word "CONVOY" to 50555 to make a $10 donation. You can also donate online or by calling 1-417-823-8998. Feeding America is working with Ozarks Food Harvest to provide emergency food assistance to those in need around the Joplin area. It is accepting donations online and by phone at 1-800-771-2303. Text "JOPLIN" to 864833 to make a $10 donation, or call 1-573-443-4523. The United Way of Greater St. Louis is accepting donations and volunteers to help those impacted in the Joplin area. Those interested in volunteering should list their availability and expertise on their Joplin Storm Recovery Volunteer Form. For more opportunities to volunteer with United Way, call 1-800 427-4626. Operation Blessing International has set up a base in Joplin to distribute relief supplies and coordinate volunteers to help local homeowners with repairs and reconstruction. It is accepting volunteers and donations to its Disaster Relief Fund. The Salvation Army's disaster-relief efforts in Joplin can be supported by texting "JOPLIN" to 80888 to make a $10 donation. You can also donate through their website or by calling 1-800-SAL-ARMY. Samaritan's Purse is providing assistance to survivors in Joplin. Its first volunteer team is on the ground, and it is asking for more volunteers to join their effort to remove trees and fallen debris and help make repairs on damaged homes. ShelterBox has sent a disaster response team to Joplin, and it is working with local officials to determine where emergency shelters and supplies can aid those displaced by the disaster. Donations to fund shelters and supplies can be made online and by calling 1-941-907-6036. Text"'TORNADO" to 20222 to give a $10 donation. You can also donate online or call 1-888-511-6443 to support World Vision's effort.